16 Character, 2 line LCD displays messages and values through the operation of the analyzer. Self-check facility and a special software ensure accurate analysis of data. Standard Fuels with their parameters are preprogrammed. Others on request. Battery operating period of 4 hours. A mere Six key to operate the complete instrument. Visual alarms for Low Bat, No Flow and Sensor Fault. 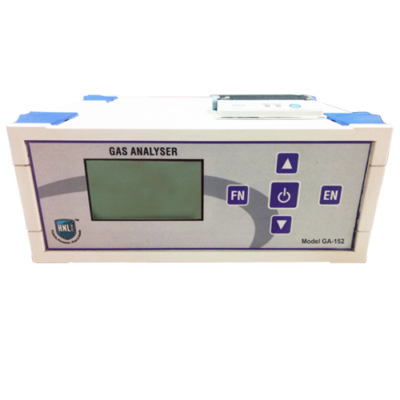 Compact, Portable construction and simplicity of operation makes HNL Portable Gas Analyser a valuable aid for insitute use in constantly changing measurement sites. Its versatile modular design permits configuration and upgradation to suit specific needs. You determine the number of Sensors for your instrument from (1 to 8) or should your analyzer have a built-in printer or RS 232 Output or a smoke test probe so you pay only for what you need. 5. Facility for Automatic analysis for specified periods at preset intervals. Self check of components and functions by special software ensures perfect functioning of the unit, thereby accurate analysis data. Any unacceptable deviation from the standard stored values is displayed as an indication “ FAULT”. Instant Printout (with Time and Date) confirms the displayed readings that have been measured and calculated at the point of test. The instrument may also be instructed to sample and analyze for specified periods at preset intervals completely unattended. Software Package to store and analyze the data in various manners with PC XT, AT, 386, 486 and Window 7 PC. 110V or 220V & AC Ni-cad battery pack with integral charger. 2.0 meters, special lengths on demand.